Love Sports AND Hawaii? How To Enjoy Both! Maybe Hawaii doesn’t have its own major league baseball team or NFL franchise, but what it lacks in professional sports it more than makes up for in national and global sporting events — and 2016 is full of them! Aloha Invitational NCAA Volleyball (Oahu): After a highly successful inagural event in 2015, the Outrigger Resorts Aloha Invitational is poised to return to the shores of world-famous Waikiki Beach April 21-23. Already being touted as college beach volleyball’s premiere event, the tournament will once again feature the top teams in the fastest growing sport in the NCAA. Ohana Cup (Oahu): The 5th Annual Ohana Cup Rugby League Festival (called the Lavalava Festival), took place at Aloha Stadium on Saturday, July 18, 2015. This year’s even is short on details… so far. But, stay tuned! Duke’s Ocean Fest (Oahu): The event is held each summer in Waikiki in honor of Hawaiian legend Duke Paoa Kahanamoku, who is fondly remembered as the greatest waterman who ever lived, and Hawaii’s ambassador of Aloha.The annual event is held at venue sites throughout Waikiki. OceanFest features a variety of ocean sports that were close to Duke Kahanamoku’s heart, including Surfing, Paddleboard Racing, Swimming,Tandem Surfing, Surf Polo, Volleyball, and more. This year’s event will be held August 20-28, 2016. 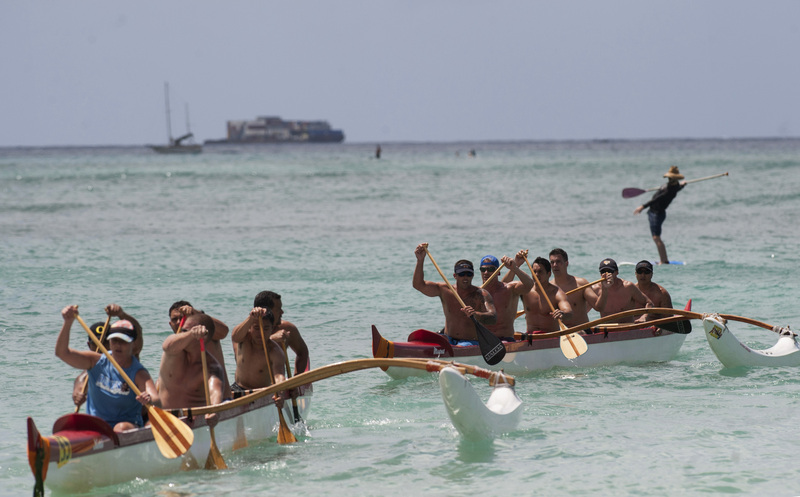 U.S. Air Force F-22 Raptor pilots of the Hawaii Air National Guard (Right) compete as team "Ho'okanaka" in a military division for active duty paddling heat during the Na Koa Wounded Warrior Canoe Regatta at the Hala Koa Hotel Beach Park Aug. 16, 2014, in Honolulu. Kauai Marathon (Kauai): The Kauai Marathon and Half Marathon begin in Poipu, the world-class resort community at the sunny southern end of the island and run the first 11 miles together. The courses follow the contour of the scenic coastline, offering magnificent views of the island’s picturesque beaches, rugged volcanic peaks, and green tropical rain forests. The event will be held Sept. 4, 2016. Ironman World Championships (Hawaii): This year’s event will be held on Oct. 8. 2016 in Kailua-Kona on the Big Island. The IRONMAN World Championship centers on the dedication and courage exhibited by participants who demonstrate the IRONMAN mantra that ANYTHING IS POSSIBLE.® On October 8th, more than 2,000 athletes will embark on a 140.6-mile journey that presents the ultimate test of body, mind and spirit to earn the title of IRONMAN. This is a great time to book a Big Island Activity through Hawaii Aloha Travel, so you can see the best of the island AND enjoy the Ironman! Xterra World Championships (Maui): The event will be held on Oct. 23, 2016 and is the world’s premier off-road triathlon, combining a 1.5-kilometer (1-mile) rough water swim, a 32-kilometer (20-miles) mountain bike and a 10.5-kilometer (6.5 miles) trail run best described as a tropical roller-coaster ride through pineapple fields and forests. EA Sport Maui Invitational (Maui): The nation’s premier early-season college basketball tournament once again features a stellar field in 2016, as UConn, Georgetown, North Carolina, Oklahoma State, Oregon, Tennessee, Wisconsin and host Chaminade battle for the Wayne Duke Championship Trophy from Nov. 21-23 at the Lahaina Civic Center. 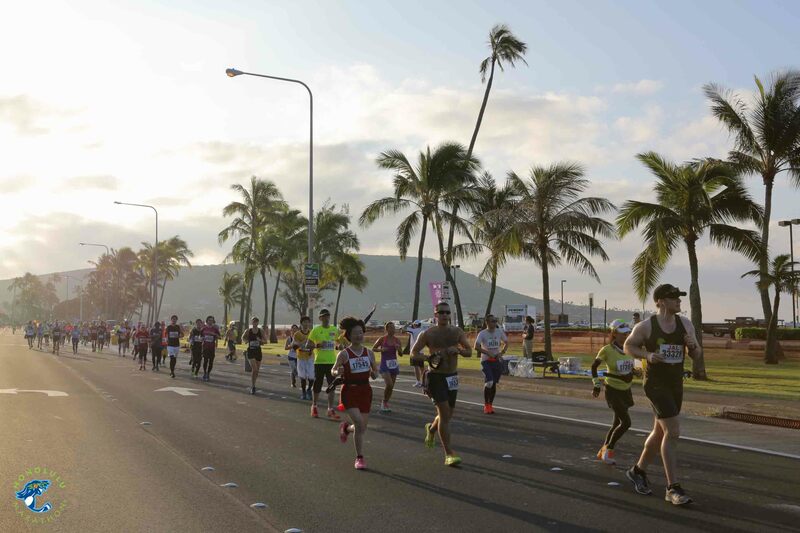 The Honolulu Marathon is a major 26.2 mile marathon that takes place in Honolulu. XTERRA Trail Run World Championship (Oahu): On Dec. 4, 2016, more than 2,000 runners from around the world are expected to gather at Kualoa Ranch on the northeastern side of the island of Oahu. The 21-kilometer half-marathon course is considered the world championship course, and it takes runners through some of the most diverse – and scenic – terrain on the planet. Diamond Head Classic (Oahu): The 2016 Hawaiian Airlines Diamond Head Classic was held Dec. 22, 23 and 25 at the Stan Sheriff Center in Honolulu. The eighth annual event will feature an eight-team field, including Hawaii, Illinois State, San Diego State, San Francisco, Southern Mississippi, Stephen F. Austin, Tulsa and Utah. The Hawaiian Airlines Diamond Head Classic is a bracket-format tournament with 12 games over three days. Each team competes in one game per day, advancing through the bracket. The two teams that remain undefeated face off in a championship game on the final day of competition. Hawaii Bowl (Oahu): The Hawaii Bowl is a post-season NCAA Football Bowl Subdivision college football bowl game that has been played annually at Aloha Stadium in Honolulu since 2002. Typically played on either Christmas Day or Christmas Eve, the game matches teams from either Conference USA or the Pac-12 and a team from the Mountain West Conference. Honolulu Marathon (Oahu): The Honolulu Marathon will be held on Dec. 16, 2016 and is is a major 26.2-mile (42.2 km) marathon in Honolulu. It draws more than 20,000 entries per year. Even though the islands don’t have a professional team, sports and Hawaii are strongly connected, thanks to all these amazing events held throughout the year. So, summon your inner-sports fan and cheer-on!